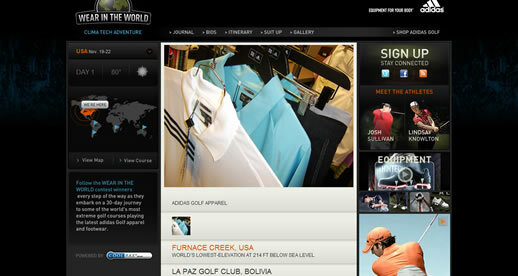 Over the past week and a half, I had the privilege of building out a WordPress site to support Adidas Golf’s Wear In The World endeavor. 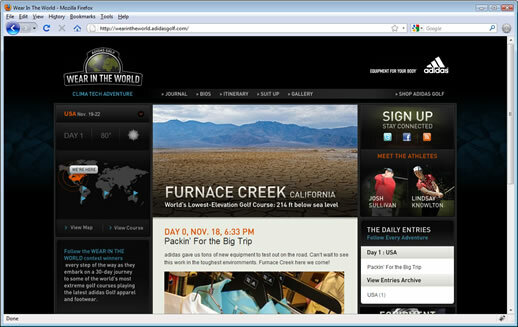 The design is based off the flash site at www.adidasgolf.com, but translated in to html to allow the two most lucky Adidas employees / contest winners to get their blog on as they travel the glove to five of the most exotic golf locations. 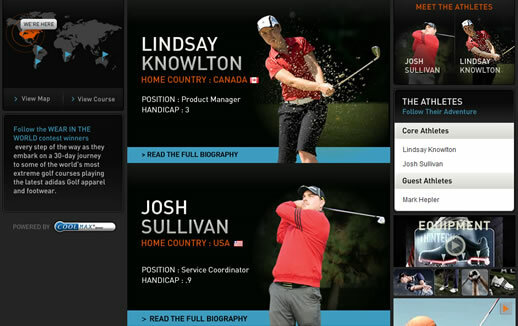 Yes, while Adidas must have lots of pro golfers who would jump at such an opportunity, employees Lindsay Knowlton, a Product Manager, and Josh Sullivan, a MATT Service Coordinator, won, and are on the road starting today! They’re journey really does pit Adidas Golf against the World’s Most Extreme Courses, as they go from Furnace Creek / Death Valley CA, 214 ft below sea level, to Bolivia, South America, 18,800 ft ABOVE sea level, to a course on the southern tip of Argentina, to the southern tip of South Africa, to the middle of the desert in Australia! And since seasons are switched in the Southern Hemisphere, Alice Springs in the middle of December is like the Mojave desert in the middle of July. Or June. Either way, weather.com says it should be hot. And speaking of hot, I am also quite proud of the nice custom Gallery set up that Matt Stallings and I masterminded. Rather than having the golfers worry about posting news, pictures, videos, and then having to micromanage separate media in a Gallery system, I built a bit of a custom setup that will pull in all the media from their blog posts automatically. So to Lindasy and Josh, Bon Voyage! The site looks great! Now that the site’s been handed to the client, it’s even better to see them putting up great images, text and video.